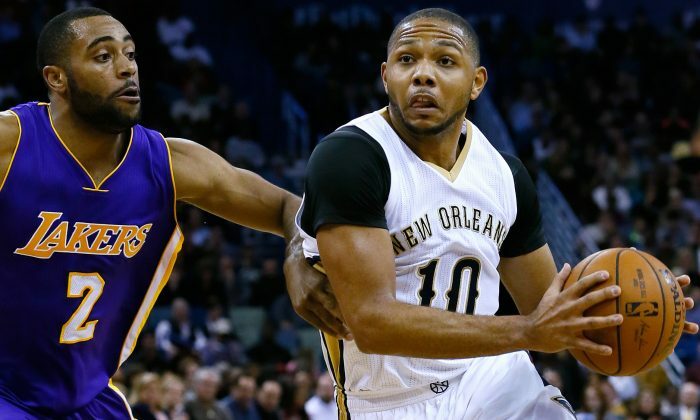 Eric Gordon is widely believed to be among the most overpaid players in the league, and one of the reasons that the New Orleans Pelicans haven’t been able to add another big piece to complement their core. Gordon signed a four-year, $58 million offer sheet with the Phoenix Suns in the 2012 offseason, but the Pelicans chose to match it. He has not lived up to expectations, with production dropping each season since. However, after underwhelming production at the start of the season, Gordon has been stepping up since returning from injury on January 5. Gordon was averaging 9.5 points per game, 2.3 rebounds per game, and 2.0 assists per game before he was injured on November 22. Since returning from injury he’s been averaging 14.8 points per game, 3.4 rebounds per game, and 4.8 assists per game, as of January 22. Bolstering the argument that he’s doing better and better, Gordon had his second career double-double on Wednesday night in a 96-80 win over the Los Angeles Lakers, finishing with 17 points and 10 assists. It’s the first time he’s posted a double-double while playing for New Orleans. Gordon has been getting significantly more minutes lately due to Jrue Holiday’s injury, seeing an average of 34.9 minutes a game compared to 31 minutes in November. Holiday’s absence also means Gordon sees the ball a bit more. 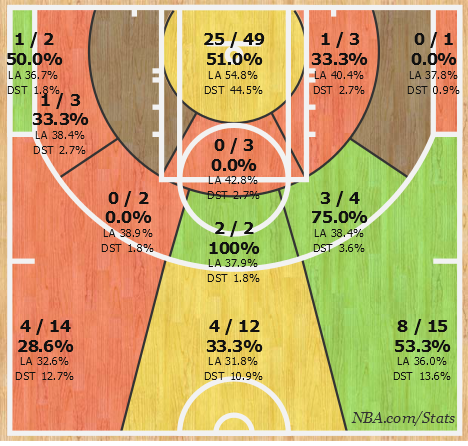 He’s taking just over 12 shots a game, converting 5.4 for 44 percent. That’s up from 9 attempts per game in November, where he was converting less than four for a 40 percent shooting percentage. Gordon is also taking and making more three-pointers–taking almost five per game, and making about two, for a nice 38 percent. He was at 33 percent before his injury. Coach Monty Williams and teammates have praised Gordon since his return, especially after the win over the Lakers. 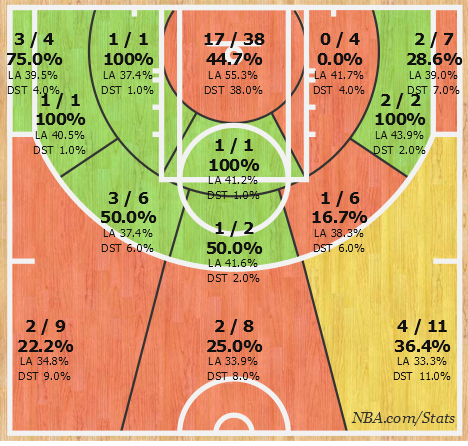 Eric Gordon’s shot chart from January, after he returned from injury. Pelicans star Anthony Davis also noted the importance of Gordon. With the February 18 trade deadline looming, it’s still possible Gordon gets offloaded somewhere. But provided he stays and continues with his current production, New Orleans could have a shot of making up the four games for the eighth seed in the West. While Gordon is definitely showing improvement, some fans remain unconvinced. They voiced their opinion on The Times-Picayune. “He definitely looked better than he usually does but one game isn’t enough to say he has turned the corner or even walked a few steps in that direction. The dude has talent but he hasn’t played anywhere close to the ridiculous salary he is making,” said one user. “EG was good last night and it was great to see him making the team better. But he has been a disaster for too long (and it was against a bad Lakers team) for me to get too excited. I would be thrilled if he could pull a game like that out every now and again; we definitely could have used it against the Celtics, Knicks,” said another.